At Detroit Sinus Center, our sinus doctor and team as a whole understands the level of discomfort associated with your sinusitis, allergies, injury, or non­allergic rhinitis. We provide medical therapy treatment to ensure your pain is alleviated as quickly as possible. For a board­certified ENT doctor serving Southfield, Allen Park, Dearborn, & Detroit, meet with our sinus doctor, Dr. Lascelles Pinnock, at Detroit Sinus Center. Dr. Pinnock always adheres to the established clinical guidelines for treatment, and offers individualized options based upon your unique needs. Nasal SteroidsUsing a nasal steroid spray can help relieve pressure and pain by decreasing the swelling in the mucous membrane lining. AntibioticsDr. Pinnock may recommend antibiotics if the sinus inflammation has developed into a bacterial infection. 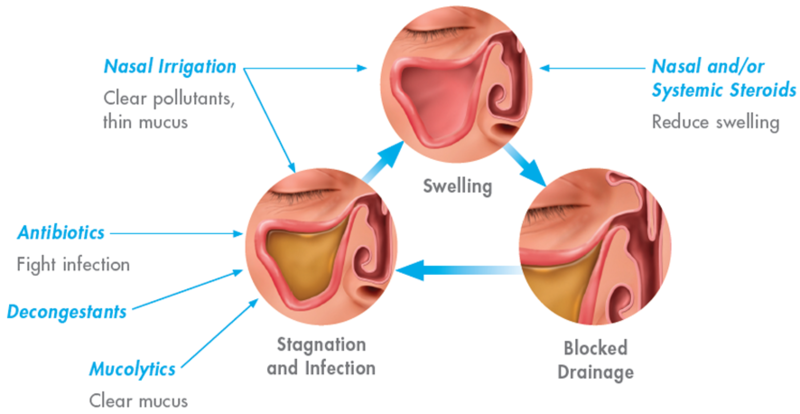 Decongestant Nasal DropsTo soothe the mucous membranes and reduce overall swelling, Detroit Sinus Center may recommend you use a decongestant nasal drop to ease breathing through your nose. Office Balloon Sinus DilationA minimally invasive office procedure that gently expands your sinus openings and repairs drainage problems. Endoscopic Sinus SurgeryA surgical procedure that removes blockage in the sinuses; this treatment method can relieve pain and improve breathing. Dr. Pinnock and the entire staff at Detroit Sinus Center are committed to helping you receive the best possible ear, nose, and throat care in the entire Detroit area. Please schedule an appointment with an ENT doctor in Southfield, Allen Park, Detroit, or Dearborn today by calling our Allen Park location at (313) 449-8871 or our Southfield location at (248) 327-3344.